Chandra's image of Saturn held some surprises for the observers.First, Saturn's 90 megawatts of X-radiation is concentrated near the equator. This is different from a similar gaseous giant planet, Jupiter, where the most intense X-rays are associated with the strong magnetic field near its poles. 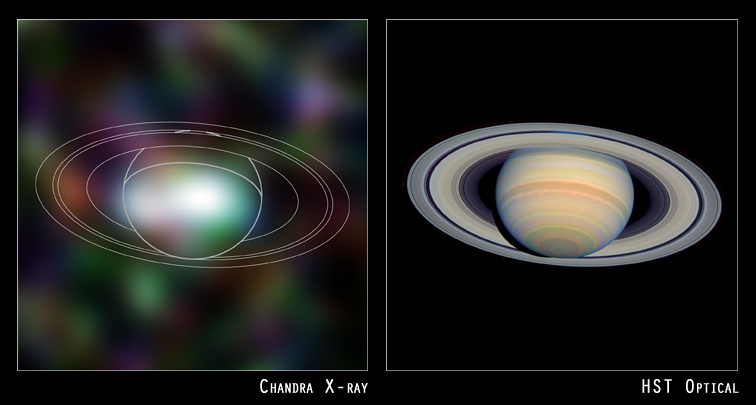 The optical image of Saturn is also due to the reflection of light from the Sun - visible wavelength light in this case - but the optical and X-ray images obviously have dramatic differences. The optical image is much brighter, and shows the beautiful ring structures, which were not detected in X-rays. This is because the Sun emits about a million times more power in visible light than in X-rays, and X-rays reflect much less efficiently from Saturn's atmosphere and rings. Scale Image is 42.0 arcsec across.